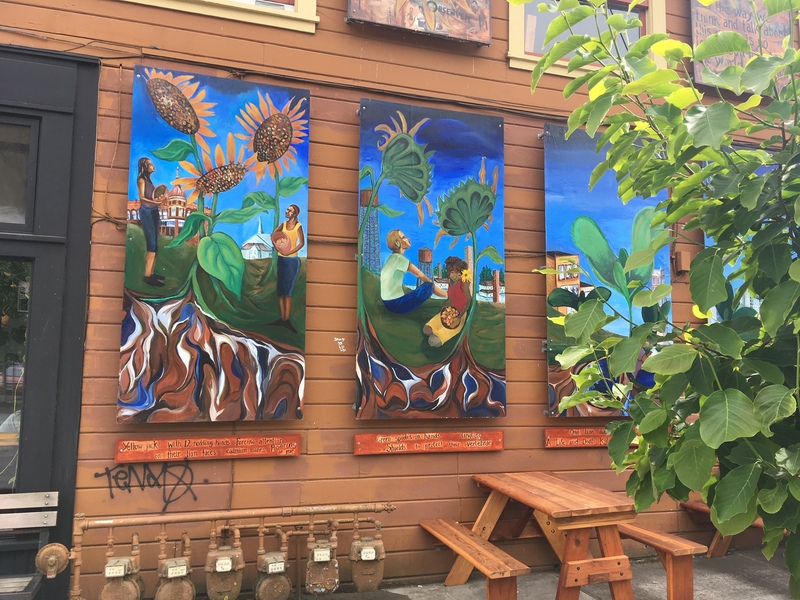 Art displayed in the elements around North Portland is there for people to look at whenever they choose. I prefer to celebrate the phenomenon of Outside Art rather than offer explanations. Figuring it out takes time away from enjoying it. 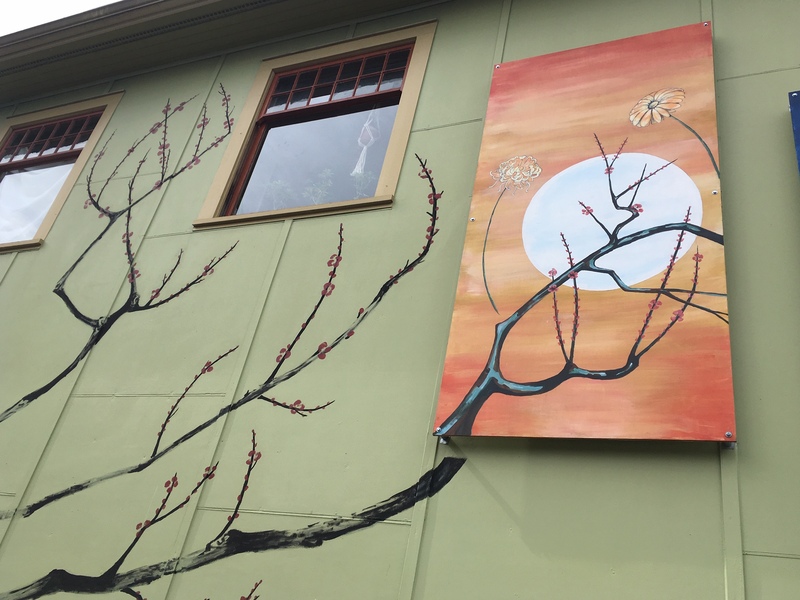 Art that could be on gallery walls or in the homes of people as decoration is now becoming part of the outdoor environment for all to appreciate. No color swatches to match or art openings to attend. Outside Art weathers critics, fans and pretensions to hang around fences and on houses. 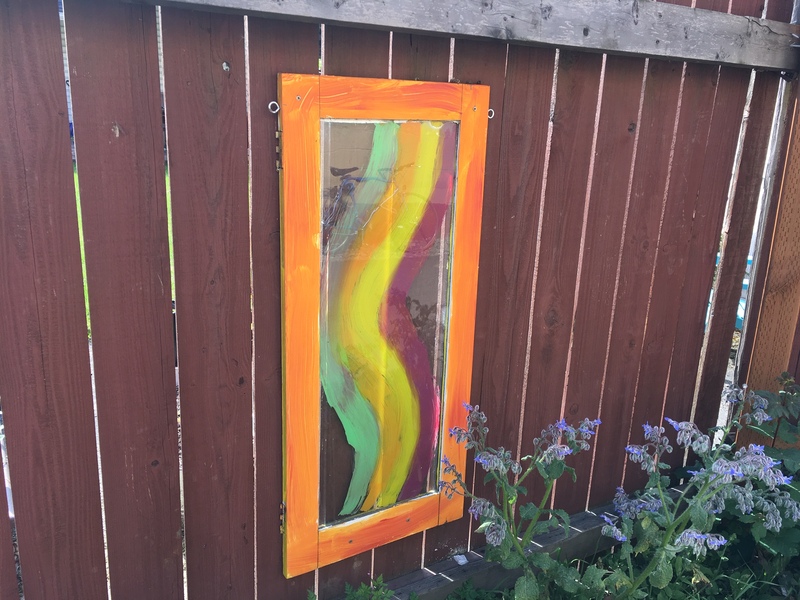 There is the risk of thievery and vandalism as well as the destructive forces of wind, rain, the occasional sun showers and even rainbow rays but this random art showcase is inspirational through perseverance and its ability to skip the art world/business gamut to exist on its own merits. 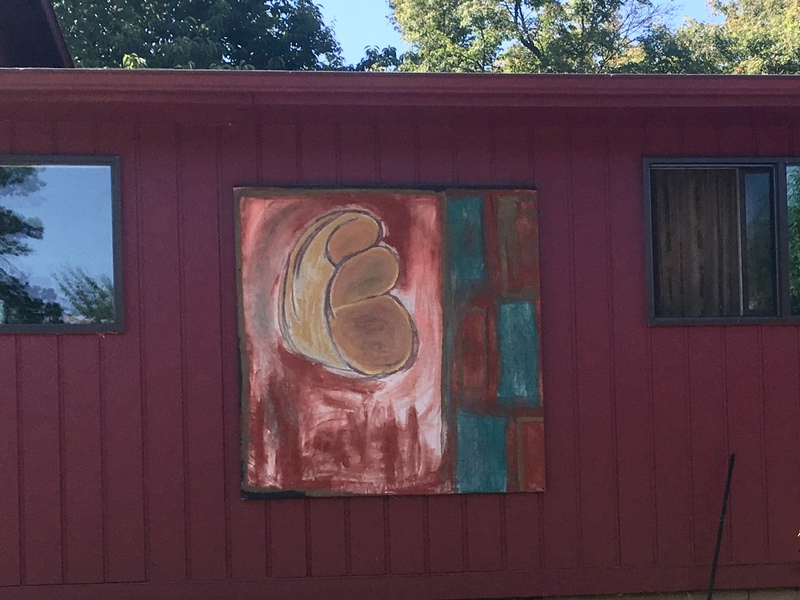 It’s a bold move to attach a large painting to one’s house. How do you get an abstract piece of art to work with certain colors of house paint? It’s tricky but it makes the declaration that creativity thrives in the home’s environment. Por qué no? Por qué yes! 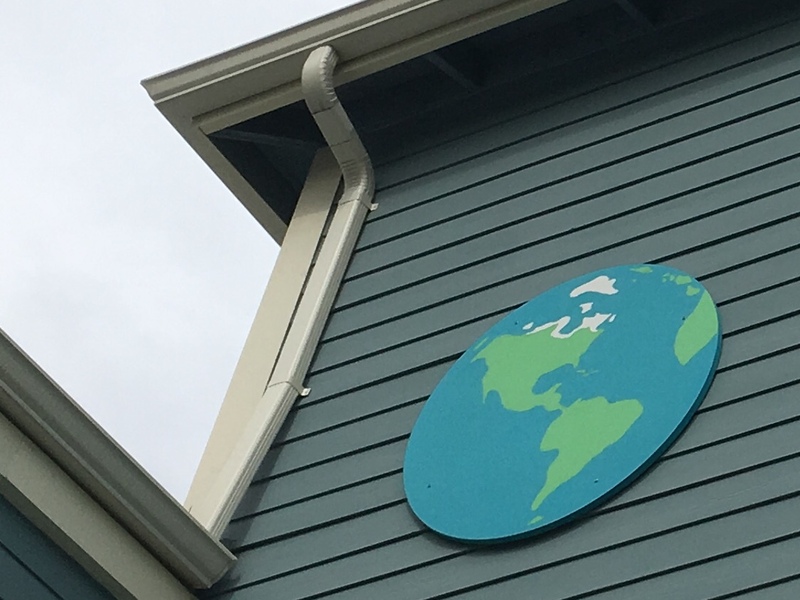 Outside Art is the perfect decoration for a business entrance. It creates authenticity. What’s authentic about it, I’m not sure. Let’s say it looks cool. It’s more of a rustic feeling, a shabby chic thing, perhaps. You won’t lose your appetite unless you look at it too long. The mecca of all Outside Art displays caught my attention last summer when I was out taking photos for future blog posts. It saw a couple of pieces nailed to telephone poles before I caught a glimpse of a section of fence with multiple works of art on it. 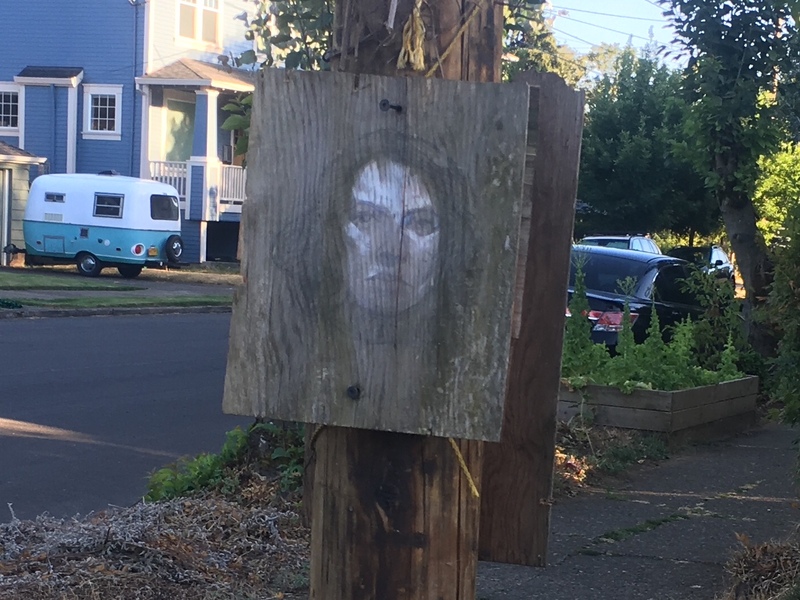 This was in the St. Johns area off of Willamette Boulevard and it has to be the work of a North Portland artist I had read about in the Oregonian right after moving to Portland. His name escapes me and his business card may still be floating around in everything that got packed up when I moved but I met him at one of his art shows a couple of years back. He was enthusiastic and willing to talk to me about Outside Art but soon after I suffered a bike accident which took me a summer to recover from. I never got back in touch with him. 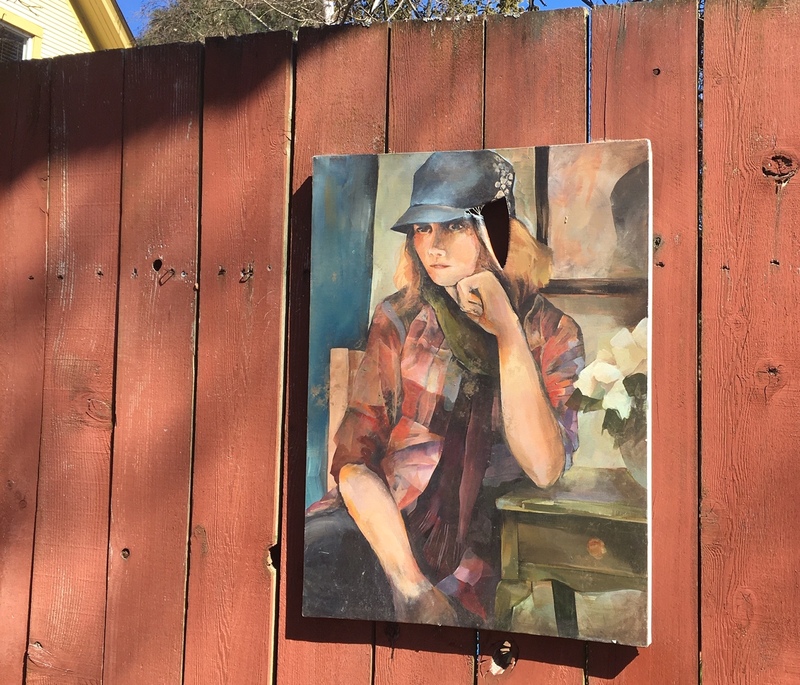 This Outside Art display, which features many portraits, makes a statement that art can be a kind of living and dying organism that doesn’t have to be locked away in a museum to be pickled and preserved forever. I appreciate it’s availability to anyone who happens by. 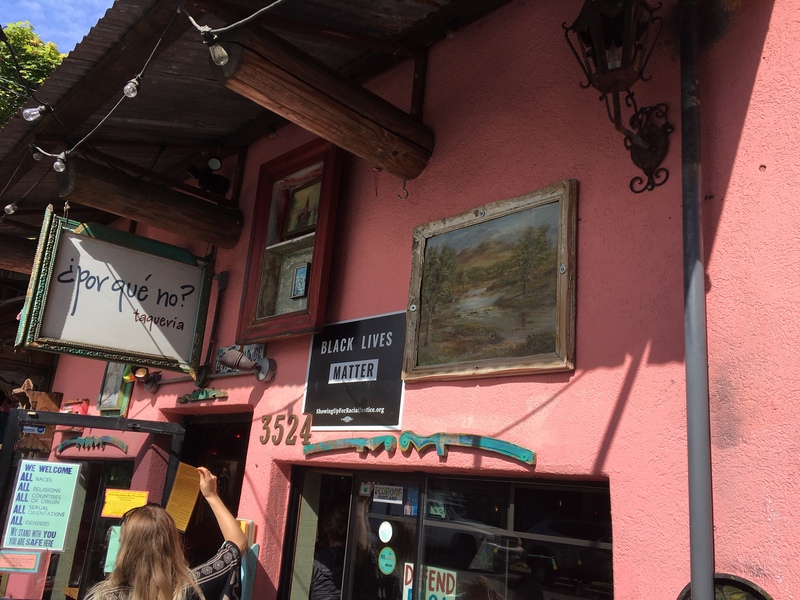 I wasn’t kidding when I felt a deep creative tremor emanating from outside of Mississippi Records that’s rooted to the center of the known creative universe. 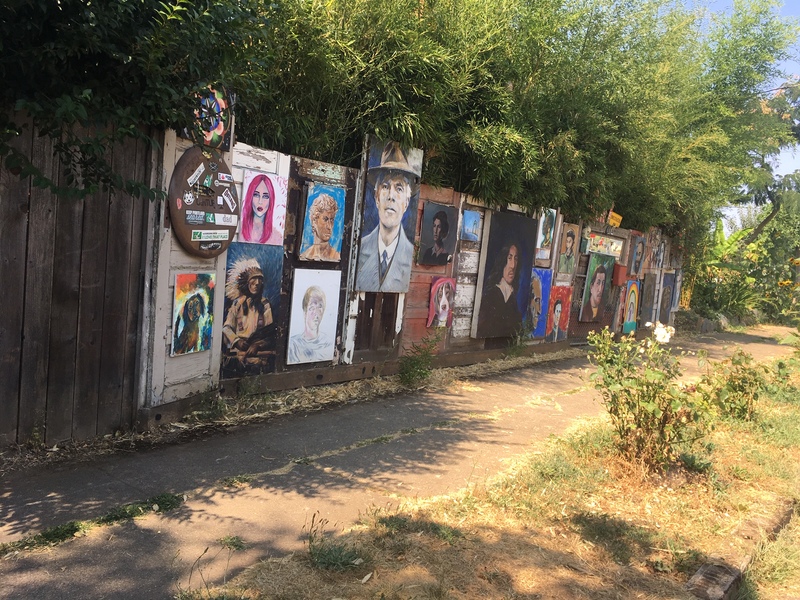 North Albina Avenue runs through this area and it’s crawling with Outside Art displays from businesses and residents alike. 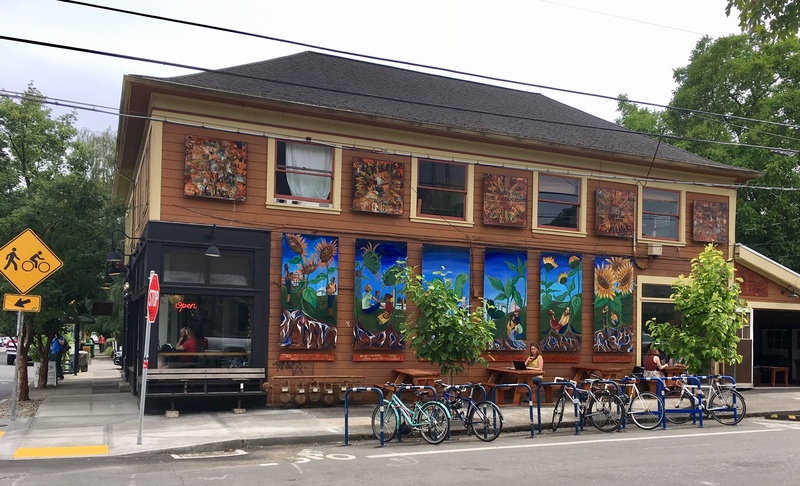 The Albina Press coffee shop boasts huge paintings on their side walls. A building the next block over seems to draw inspiration incorporating a mural that morphs into huge painted panels. 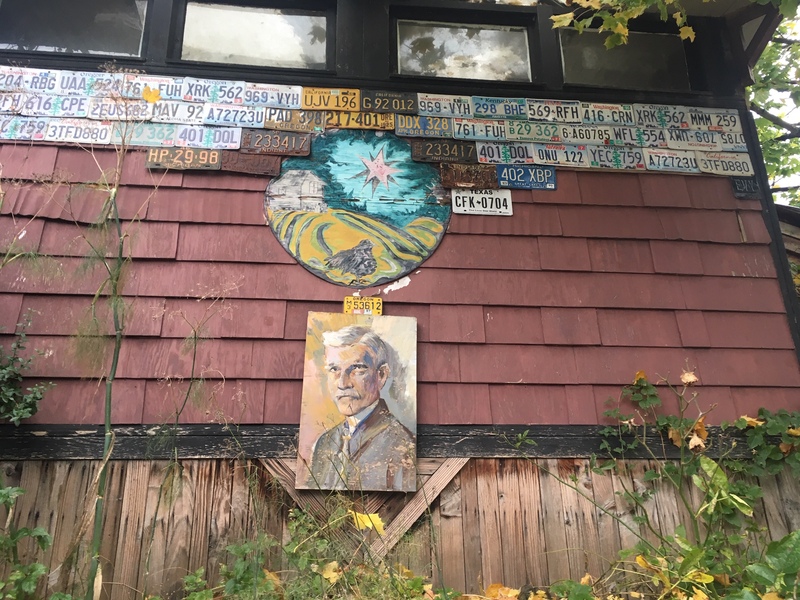 Further up North Albina Avenue from the Mississippi District, a resident combined a couple of pieces of Outside Art with displays of recycled license plates. Even the dentist office on North Albina Avenue gets into the game displaying rudimentary Outside Art that’s more fun and frivolous while still meeting with current Outside Art standards. 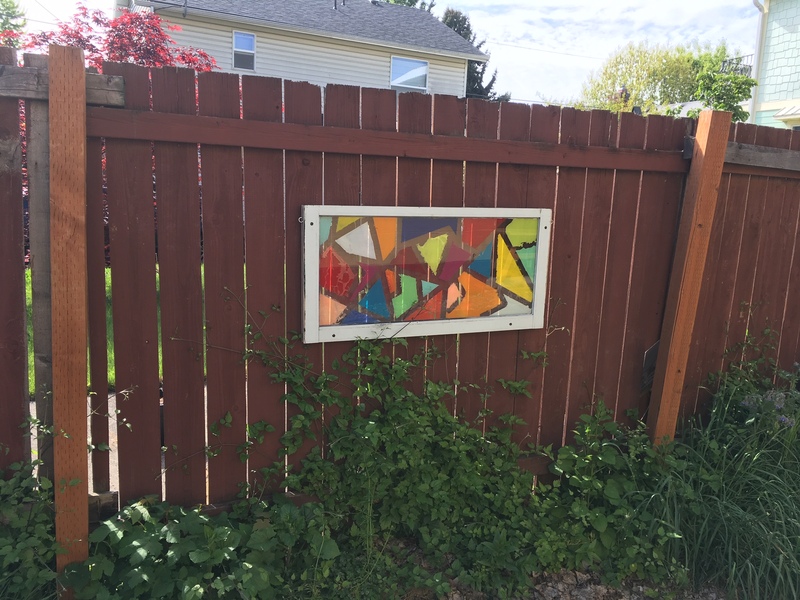 In the Woodlawn neighborhood, I came across art hung on a fence. The work’s merit is marred by a gashed canvas. The question remains whether the art became Outside Art after it was tarnished or if the damage resulted from it being displayed outside. 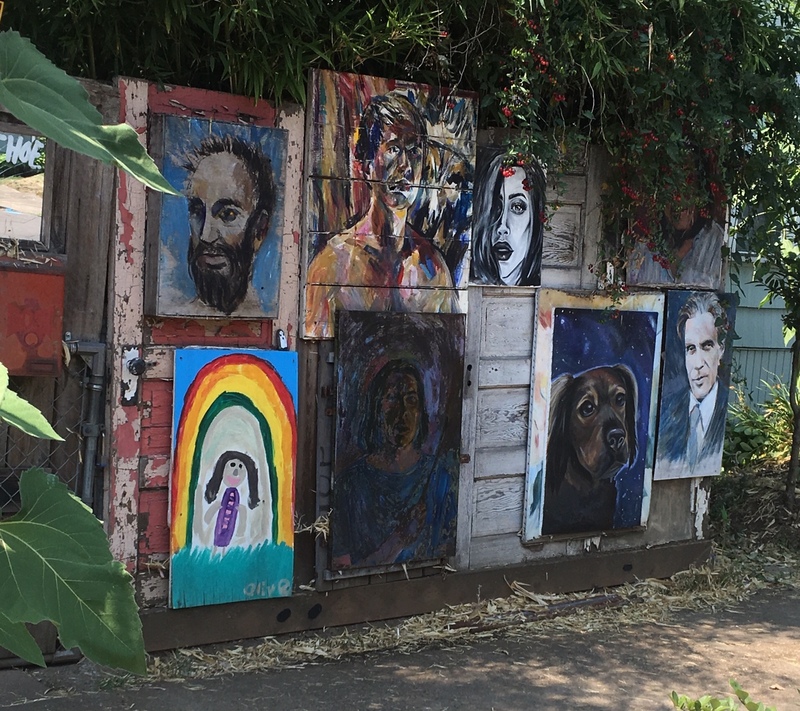 In a back alley behind a Mississippi District Tea shop you’ll find paintings affixed to fencing. These colorful, bold abstracts demonstrate that Outside Art can always be used to spruce up even the drabbest of surroundings.